The deep red and pale pink blooms in this Paper Envy suite radiate romance, but it’s the details that make it shine—literally. Designer Debbie Pape uses rose-gold foil for the couple’s names and the card’s beveled edges, adding a little extra glitz. The relaxed font complements the dreamy florals, for an elegant, modern suite. 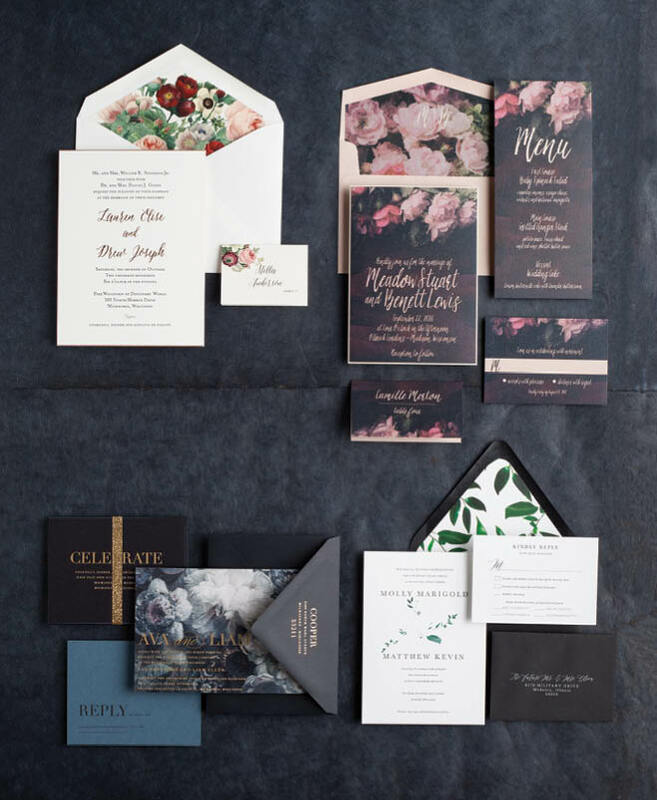 “In a sea of light and airy wedding designs, this dark and romantic invitation offers a boldly refreshing option,” says Deb Hackbarth of Paperwhites. Here, she uses a whimsical typeface, reminiscent of handwritten love letters exchanged between sweethearts. The plum tones and classic bouquet show off a flair for the dramatic. Heather Raffel of Sugar River Stationers designed this sophisticated suite based on a still life by Dutch painter Cornelis van Spaendonck; incorporating art into the design is a hallmark of her work. Off-center gold text adds intrigue, while the response card features a paper Raffel has long dreamt of using, with a deep blue that stirs memories of the ocean. The theme: Luxe garden party. Haley Mueller and Emilee Robenhorst, owners of Mint & Lovely, created a clean design that lies in the understated details: Textured stock, a blind-embossed ampersand and a statement black envelope combine for a modern, approachable suite. No need for floral overload—an elegant greenery motif tells the tale of the outdoor wedding to come.